As if we haven't already had enough news these days, Phils fans, there is indeed more... this time, though, it's a loss -- at least, for us. Born in Miami to Cuban exile parents, Perez -- who spent much of his formative years living in the New York metro area -- was ordained for the Philadelphia church in 1989. Later to serve three of the diocese's bishops as their priest-secretary, Brennan became a priest for the 1.5 million-menber Long Island diocese the same year after obtaining a degree in mathematics from St John's University in Queens. 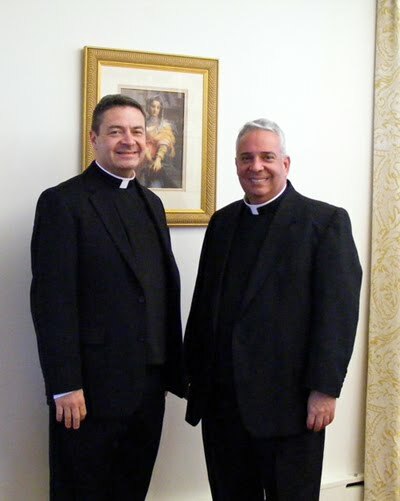 As recent nearby nods go, the duo join the twin auxiliaries of Brooklyn -- Bishops-elect Raymond Chappetto and Paul Sanchez -- who were named last month and are set to be ordained on July 11th, the feast of St Benedict. Today's bishops-elect will be ordained exactly a fortnight later -- 25 July, the feast of St James -- in their see city's St Agnes Cathedral. One of two all-suburban folds in the US church, the Rockville Centre diocese (encompassing Long Island's Nassau and Suffolk counties) was carved out from Brooklyn in 1957. Especially given the place and timing, it's worth noting that, as head of an inner-city evangelization apostolate, Perez was made Philly's first Hispanic monsignor in 1998 by a Long Island native -- the now-deceased Anthony Cardinal Bevilacqua -- whose alma mater, the Seminary of the Immaculate Conception at Huntington, will see its last graduates ordained to the priesthood tomorrow. Come September, the major seminarians of Rockville Centre and Brooklyn will cross the East River to be formed in the New York archdiocese's house at St Joseph's, Dunwoodie. The last time a hometown priest was named an auxiliary beyond Pennsylvania's five southeastern counties came in late 1992, when Msgr Joseph Galante -- then undersecretary of the Vatican's "Congregation for Religious" was appointed an auxiliary of San Antonio. After a dozen years in Texas, the native of the city's Northeast section returned home as bishop of Camden. As head of the South Jersey church of 500,000, Galante -- an Eagles season-ticket holder who's owned a Shore house since the 1980s -- is believed to be the lone American prelate who vacations solely within his own diocese. A former USCCB Communications chair, after years of difficult health the 73 year-old bishop began dialysis treatments over recent months. In 1960, my parents, David and Emma, along with my older brother, David, who watches the unfolding of these events from heaven, came to this country from Cuba, seeking to preserve the freedom that God had given them that was quickly taken away. I like to say that I was made in Cuba and unpackaged here, for six months later I was born in Miami, Florida. A few years later, we moved not far from here, to Northern New Jersey, were I grew up in a little town call West New York, over looking the New York skyline. My brother Luis Martin, was born in Hoboken. So in many ways, I return to this New York Metropolitan area which I called home for half of my life. I have been so blessed with a faith‐filled family, that nurtured my faith and vocation to the priesthood. Without them, I would not be here today. Two weeks ago, I had the joy of celebrating the Feast of Pentecost at the parish where I serve as pastor, which by the way, is St. Agnes, in West Chester, PA. The theme of my homily was “God is a God of surprises”. Little did I know then that two days later, I would be receiving a surprise phone call from our Apostolic Nuncio, Archbishop Vigano, informing me that the Holy Father had appointed me auxiliary bishop of Rockville Centre. Needless to say, I was stunned! For the last week, I have been walking around waiting for another call telling me that there had been some sort of mix up, but that call never came and the surprise has continued and thus I find myself here today among you. In his acceptance, meanwhile, Brennan said he had to admit to being "a little nervous here. "I hope and pray I am up to the task," he added. "Yet our confidence, our hope, and our strength though, is not in our own abilities but in Christ." As bishops-elect, the appointees are able to attend and vote at next week's USCCB meeting in Atlanta. Meanwhile, the loss of a well-regarded Philly priest comes amid a notable shift at the beleaguered archdiocese's headquarters. Precisely nine months since taking the reins of the Philadelphia church, it emerged late last night that Archbishop Charles Chaput OFM Cap. had named his top deputy, Bishop Timothy Senior -- head of the sprawling Chancery apparatus since 2009 -- as the new rector of St Charles Seminary, Overbrook. Raised to the episcopacy three years ago today, the classically-trained administrator -- a double-graduate of Boston College in business and social work -- will be replaced as vicar-general by Msgr Daniel Kutys, a current parish priest in the far suburbs who previously spent several years on loan to the US Conference of Catholic Bishops as head of the Mothership's education and catechesis arms. Announced among the archdiocese's traditional June torrent of clerical changes, the moves take effect on July 2nd. "A Gift to Philadelphia and the Whole Nation"